Photo credit: Lucy Diggins-Wold. Wyoming Game and Fish Department biologist Cole Hansen untangles and tags a deer Dec. 18 outside of the underpass off Highway 789 north of Baggs. Biologists are tagging deer to better understand migration patterns and population. Local sportsmen, students and game wardens joined wildlife biologists in an effort to better understand populations of mule deer. Wildlife biologist Tony Mong with Wyoming Game and Fish is leading an effort to trap and mark deer using the wildlife underpass five miles north of Baggs on Highway 789. The project began last year and is expected to continue for the next four years, Mong said. “Over the next four years crews will be trapping up to 100 deer per year and attaching the traditional ‘visual’ ear tags and, on a subset of deer, a ‘visual’ white collar to make sure we achieve a viable mark-resight sample size,” a press release stated. 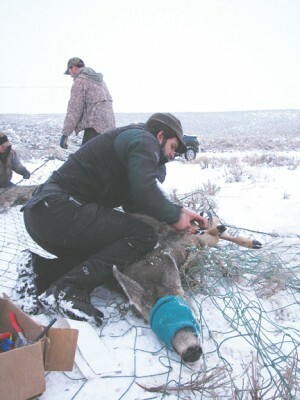 Deer are baited with apple pulp while a crew hides in a blind and waits to release an electro-magnetic operated net on nearby mule deer, according to the press release. Wyoming Game and Fish are tracking the deer to figure out if they are using the underpass multiple times during the same migration period, Mong said. Understanding how the deer use the underpass will help keep a more accurate count of the population. The project will also help gauge how effective the underpass is and aid in collecting data to manage the population and figure out where the deer migrate, he said. The project has already given insight into local deer herds, Mong said. Deer have been found to migrate as far as 40 miles, from Baggs to Rawlins — a long range for deer to travel. Several different methods of tracking the population exist, Mong said. The more information that is collected will contribute to more accurate estimates. The deer-tagging project will start November 2013. Those wanting to volunteer should be on the lookout for more information at the end of 2013.